JNN 13 Sept 2014 Bombay : Emboldened by the rightist Hindu Prime Minister Narendra Modi, Hindu groups have been railing against other faiths in India, vowing to work on converting the whole Muslim and Christian communities within the next decade. “The Hindu wave has just begun. 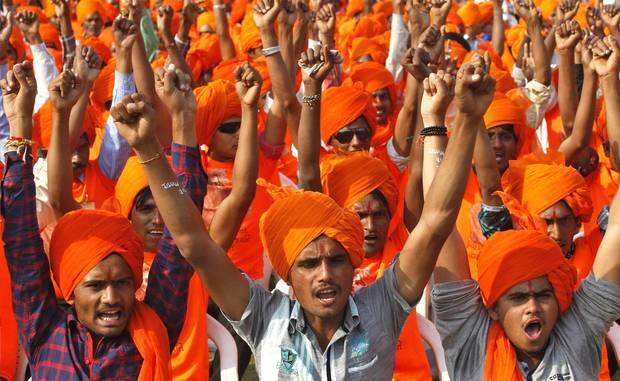 In 10 years we will convert all Christians and Muslims,” Hindu activist and Rashtriya Swayamsevak Sangh (RSS) member Rajeshwar Singh said during an event to convert a Christian family to Hinduism in the rural town of Hasayan, 140 km (87 miles) south of Delhi, Reuters reported. “We will cleanse our Hindu society. We will not let the conspiracy of church or mosque succeed in Bharat (India),” he said, standing in the family’s front yard by a ritual fire lit to purify the poor, lower-caste converts. Along with Sangh, other vocal speakers from RSS have been used by the Hindu nationalist Bharatiya Janata Party (BJP) to openly declare India a nation of Hindus, posing a challenge to its multi-faith constitutional commitment. About a fifth of India’s 1.27 billion people identify themselves as belonging to faiths other than Hinduism, including more than 175 million Muslims. Increasingly hardline statements by RSS chief Mohan Bhagwat, an old friend of Modi, have helped motivate millions of volunteers. “Just as those who stay in England are English, those who stay in Germany are German, and those in US are Americans, all those who stay in Hindustan are Hindus,” Bhagwat said in August, angering India’s Muslim and Christian minorities. Prime Minister Modi, from Bharatiya Janata Party (BJP), has been active in RSS group since childhood. Offering Modi unprecedented support, RSS volunteers have gone from door to door to convince people to support their colleague in the biggest mobilization since 1977 when RSS workers went door to door encouraging people to vote against Indira Gandhi. Though Hinduism is not a religion that normally seeks converts, activists like Singh have stepped up what they see as necessary defensive measures by converting others “back” to Hinduism. “The Hindu wave has just begun. In 10 years we will convert all Christians and Muslims,” shaven-headed Singh said with a grin after Friday’s conversion ceremony, to murmurs of approval from other organizers of the ritual. RSS has been founded by Keshav Baliram Hedgewar, an independence campaigner who had split from the Indian National Congress party over what he considered “undue pampering of the Muslims. Launched in 1925, the group has been banned thrice by the Indian government in 1948 and 1970s and 1990s. Surrounded by ambiguity, the group faces accusations of fueling religious conflicts by their opposition to the Indian constitution’s article No 370 which grants Kashmir its special position. Moreover, they have campaigned for years to support Ram temple in Ayodhya, on a spot where 16th-century Babri mosque once stood. With one of their group at the top of the world’s second-most populous country, RSS leaders see Modi’s term as their golden age. “The BJP is our political organization. They are our brothers. We have ensured that they won the election. Modi is a Hindu leader,” Singh said. This entry was posted in Jafria and tagged Bharatiya Janata Party, Narendra Modi, Rajeshwar Singh. Bookmark the permalink.